With great weather, a great crowd and some great bikes, the Bike Life Classics Day at the Sammy Miller Museum on Sunday, June 24, surpassed all expectations, with almost 1400 bikes in attendance – the most ever. Renowned bike builders Don and Derek Rickman were presented with Bike Life Classics Lifetime Achievement Awards, and indeed a Rickman Kawasaki 900 took the best in show award, with other trophies being presented to the owners of a Vincent Grey Flash, Kawasaki Z1, Norton CS1 and Triumph Tiger 90. Think of the stories the characters in this picture could tell. Framed by two immaculate Rickman machines, Peter Williams was the worthy winner of the Bob Andrews Trophy at the Bike Life Classics Day on Sunday, June 24. Interviewing him is the ageless racing and trials legend Sammy Miller, while to the left and right in the black shirts are the Rickman brothers Don and Derek, who were presented with BLC Lifetime Achievement Awards. The Bob Andrews Trophy went to legendary road racer and development engineer Peter Williams. 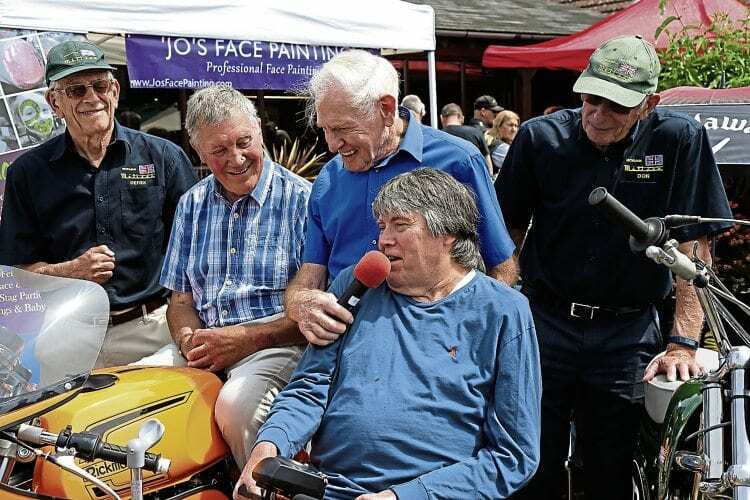 The many static and trade stands included Gearlink Kawasaki, BRT Racing, the Vintage Japanese Motorcycle Club, Oxford Products, British Motorcycle Charitable Trust, Burnout Bikes, VP Motorcycles and Hollis Motorcycles, and H&H Auctioneers also helped to made the day a great success.